UNITED NATIONS, May 20 – On a day at the UN when the slaughter in Sri Lanka was discussed, and the impending re-imprisonment of Aung San Suu Kyi in Myanmar, two celebrities spoke at the UN and were, some thought, a study in contrasts. Venezuelan actress Patricia Velasquez , who is already an Ambassador for UNESCO, was given a “Women Together” award for her work with indigenous people. Inner City Press asked her, as UNESCO Ambassador, if she thinks the Organization does enough about press freedom in Latin America, particularly in Venezuela. Video here, from Minute 16:57. She replied that Venezuela right now has many problems and discussions about freedom of the press, but that to wait for a bureaucracy to act was not the right approach, both journalists and civil society should say, “This cannot be.” That is, she did not duck the question. 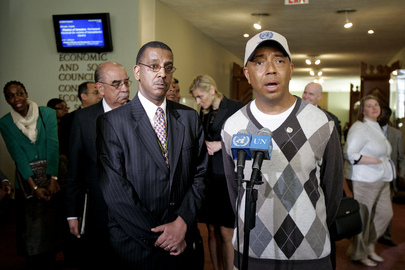 Russell Simmons appeared, newly named a UN Ambassador on issues surrounding the trans Atlantic slave trade. With him with the Permanent Representative of Jamaica, Raymond Wolfe. Inner City Press asked Simmons to describe what he would do as Ambassador, and would he get a UN passport? Simmons and his entourage laughed; Simmons said, “I already have a passport.” Video here, from Minute 1:09. Jamaica's Ambassador Wolfe then came to the microphone, arguing that Simmons' appointment has nothing to do with getting a UN passport. Simmons whispered, “No passport?” Wolfe answered, “It comes, later.” Video here, from Minute 2:39. Simmons then retired to the Indonesian Lounge to shake the hands of waiting Ambassadors. Meanwhile the Ambassador of Indonesia sat, serious faced, in the hallways talking on his cell phone. It emerges that there is a draft Presidential Statement for the Security Council about Aung San Suu Kyi, for now “deploring” the government's trail of her, which the UN Country Representative is now allowed to attend (but apparently not speak publicly about). She is charged with violating the terms of her house arrest for allowing an American swimmer to stay in her compound. Since the timing helps the government, led by General Than Shwe, Inner City Press is calling ASSK's uninvited guest “Than Schwim.” The prediction is that it will be watered down to the ASEAN position, “gravely concerned.” Only at the UN.